Home > News > Feeding the World with LEDs? Feeding the World with LEDs? 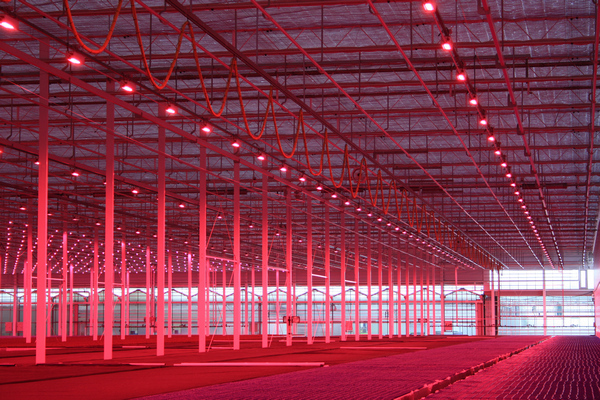 Jan Willem Vogel, who is responsible for global business development and marketing at NXP, delves into LED grow light applications in this latest blog entry. Plants are amazing. They turn light energy into the sugars that form the basic fuel that all life on Earth depends upon. This process – photosynthesis – uses the light to energize the combination of Carbon Dioxide (CO2) and Water (H2O) to create Glucose (C6H12O6) – freeing Oxygen (O2) as a useful by-product – which is then processed by the plant into the more complex substances needed for growth. As the plant grows so it becomes food for more complex organisms – including humans. 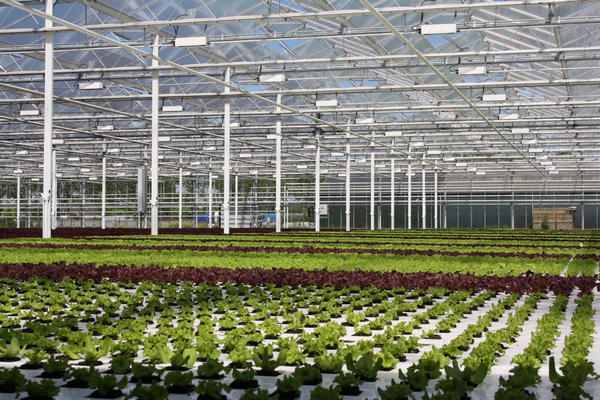 Man has always grown food outside in fields, but increasingly, due to the issues arising from a growing global population and increasing costs of traditional agriculture, food crops have been grown in carefully controlled indoor environments. This trend started out with greenhouses using natural light but controlled heat, humidity and temperature. The introduction of artificial light advanced this process further by increasing the time each day that a plant can grow. Today the majority of these greenhouses still use conventional high intensity discharge (HID) lamps for lighting. However, the latest innovation is the use of light emitting diode (LED) lighting designed to deliver a carefully defused mix of coloured light optimized to deliver the fastest growth for each plant species in various stages of growth. By emitting only the light that the plant needs, the growing process becomes more efficient. And higher yield is not the only benefit; the enhanced level of control can also impact plant quality by optimizing other aspects like colour of leaves etc. The low levels of heat generated by LEDs also mean that lamps can be placed closer to the plant, thereby further improving efficiency and allowing greenhouses in warmer countries to extend daylight and increase production by artificial lighting without over-heating. Initially LED was only used to enhance HID lamps. Further improvements in LED technology have since enabled LED-only lighting in green houses. Plants basking under LED grow lights in an indoor farm. The latest development in advanced horticulture completely does away with natural light. This is often called vertical farming because it can be done in multi-layer set-ups. This can be done in warehouses and industrial buildings – sometimes suitably called “plant factories” – close to the consumer. So what does this mean in roots and leaves? The answer is the opportunity for massive efficiency gains. Standard horticulture typically requires 15,000 square metres to feed one person for a year. Vertical farming of this type can produce the same amount of food from just 365 square metres – and increase in productivity of about 41 times and potential for incredibly more effective use of scarce, high quality horticultural land. Closed loop agriculture of this sort can also ensure that water and nutrients are recycled, again making water savings of up to 90% over more traditional techniques. The technique also means that the producer does not have to be concerned about weather related crop failure, while infectious diseases and pests are also greatly reduced and easily controlled, and this virtually eliminates the need for expensive pesticides and fungicides. Although not all crops are suitable for such growing methods, there is little doubt that these vertical farming techniques will become more widely adopted – the ongoing global increasing demand for food from a growing world population dictates that farmers have to find ways of improving yields, and likely increases in transportation costs will mean that growing closer to population centres will become more viable as improvements in the technology, such as the on-going improvement in the efficiency and cost-effectiveness of LEDs, will also continue to reduce the costs of vertical farming. NXP Semiconductors and Lemnis Oreon (producer of agro LED lighting) have worked together on significant innovations in LED technology for various forms of horticulture. Most recently they revealed a proto-type of an innovative 600W LED lamp that drives LEDs closer to their maximum capacity without the risk of LED failure. It also allows downsizing of heat-sinks and other cooling arrangements (making lamps smaller and lighter), manages the photon flux precisely (reproducibility) and allows precise and completely flexible control of the color mix (flexibility). By using modern communication technology these new lamps automatically configure themselves into a wireless local area network that allows them to be controlled locally by smart phone, tablet or computer. By connecting this local network to the internet, lighting recipes can be downloaded from databases in the cloud, thereby enabling farmers to utilize the latest scientific insights and monitor and control their lighting from anywhere in the world. The Internet of Things (IoT) becomes the internet of plants. As these innovations continue LED farming will become even more attractive to producers of a wide range of crops, so that one day it is conceivable that the world will be effectively fed with LEDs.